O On Tuesday, coincidentally the 46th anniversary of Roe v. Wade, passed the New York State Senate's Reproductive Health Act and it was signed by law Democratic Gov. Andrew Cuomo. The law, which is probably the country's most extensive abortion legislation, allows a later abortion until the baby's due date if it meets certain requirements. This kind of legal protection of late abortion is not only an insult to the human race of the unborn and the dignity of society, but New York has publicly celebrated it as if it has just won the Super Bowl. When the bill was passed, a video shows the assembly chamber erupting in cheers, with politicians and audiences clapping the bill as if it were a winning symbol of strength. That night, the One World Trade Center shone in pink to honor the passing of the bill. Imagine, a beacon of capitalism, which is not the freedom and prosperity, but the "freedom" that marks the path toward killing children. Of course, Planned Parenthood applauded the passing of the bill with yes-words and an emoji. This. Is. Huge. @NYGovCuomo JUST has enacted the Reproductive Health Act – a big win for ensuring safe, legal abortion and access to contraception for all! Two of the most abhorrent parts of the bill describe the new parameters of abortion: if "the patient is within twenty-four weeks of the onset of pregnancy" and second, and this is the worst qualifier, "or Abortion is necessary to protect the life or health of the patient. " The formulation of this second sentence is so comprehensive that protecting the patient's health, even in legal languages, can mean almost anything. 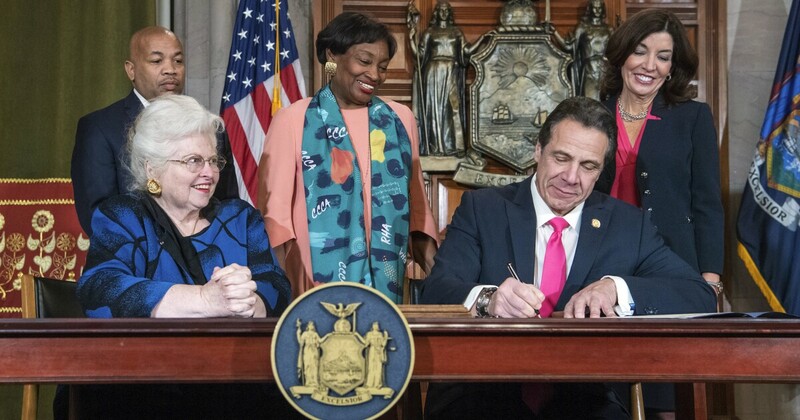 This new bill ensures that New York is the most advanced of all federal states when it comes to "reproductive rights" (an absurd term for baby killing). According to the CDC every third unborn child in New York City is canceled. Statistics also show that more black babies are chipped than were born alive in New York. The New Yorkers are not only discouraged by this news, they also celebrate it. It is clear that this is not the passing of abortion rights, but permission to commit infanticide and call it a different name – an eight-pound baby can survive outside the womb with very little medical help. Late abortion procedures are cruel and graphic: The Lozier Institute reports "Abortions that are performed after 20-week gestation, if not performed by induction of childbirth (which leads to prematurity) are the most common Particularly cruel surgical techniques involve crushing, dissecting, and removing a fetal body from a woman's uterus just weeks or even after the fetus has reached a developmental age of potential viability outside the mother. " Did the State Assembly and Senate know that and they are still applauded, or are we somehow assuming in the Age of Information that they are deliberately unaware of the procedure? A bill that allows and celebrates abortion on this scale is disgusting the politicians in New York the I have overlooked the dignity and holiness of the East in our society to further their own progressive self-interests. Nicole Russell ( @russell_nm ) is a contributor to the Washington Examiner Beltway Confidential Blog. She is a journalist and previously worked in Republican politics in Minnesota.